Wonder Woman #12 Review OR I Really Didn’t See That Coming At All!! Seriously, the ending of this book is NUTS and you REALLY don’t want to read about it here if you haven’t read the issue yet. Don’t rob yourself of an awesome “What the hell? !” moment. You’ll kick yourself and regret it until the day you die. So, let’s do a quick rundown and then go through the three big things we learned. There’s a big dust up on Mount Olympus and Apollo takes the throne and banishes Hera. Hermes escapes with an in labour Zola while Wonder Woman gets SUPER powerful and kicks the crap out of Artemis. Then Wonder Woman goes back to Earth to Zola but Hermes has stolen the baby and given it to Demeter (told you she’d come up again!!) and then the crazy ending. She’s got Zeus powers!! And she schooled Artemis easy peasy. She could have taken out Apollo too, but instead they cut a deal that he won’t harm Zola’s baby. Obviously, these Zeus powers are new. I’m not sure if they’re something she’s had forever that’s been kept in check or something that came about when she found out about Zeus being her dad. Seeing as this is a new universe still, we don’t have a lot of backstory. Maybe next month with the #0 issue we’ll learn more about these powers. Regardless of when she got them, keeping them in check is a very Wonder Woman thing to do. Both so she wouldn’t hurt people with them AND so that she wouldn’t get corrupted by such epic power. They’re a new addition to the character, but handled in a very Wonder Woman way. 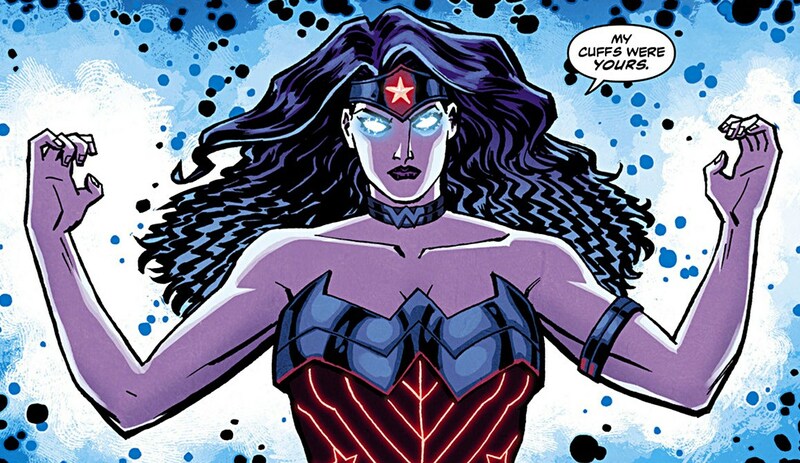 I’m not entirely sure how I feel about Wonder Woman having this much power. I’ve liked how Wonder Woman’s been portrayed as strong and capable but not to the levels of invincible or unstoppable. Did she even fly before Hermes hit her with the feather in this issue? I think it’s much more interesting when a character CAN be beaten, because when they win it means more. Now, the bracelets will maintain her former power level, but knowing she can bust out Zeus powers whenever she needs them sort of lowers the stakes. But they are very cool, and I do love that she keeps them contained. We’ll have to see how they play out. Second, I’m very sad to say that Hermes is the traitor. I’ve been worried for months that it would be him, since they’ve been teasing it in the solicits and he was sort of the obvious choice because he’s not the obvious choice, you know? Lennox is new and crotchety and hasn’t earned trust yet, so that’s too obvious, and Strife is just Strife. Hermes is the only one Wonder Woman and Zola really trusted. So he stole the kid and gave it to Demeter!! That bugger. I LOVE Hermes… he’s my favourite character in the entire DC universe right now, and I really hope he had a good reason for this and that he gets some redemption. If he’s just a jerk like all the other gods, I’m going to be bummed. But Demeter seems like a gal who sees the bigger picture with things and hopefully they concocted this plan for the baby’s own protection. It looks like when we come back in October, Wonder Woman is going to be hot on Hermes’ trail, so I assume at some point we’ll get a confrontation where all the cards are laid on the table. Until then, it looks like my favourite character won’t be around and part of the awesomest team-up ever. Not cool. NEW GODS!!!! WHAT??!! That’s so fun. SO random, but so fun. That dude seems to be Orion, from the helmet, and he’s taking off through a boom tube to who knows where. Orion is, if you don’t know, the son of Darkseid, the evil ruler of Apokalips who we saw in the first new Justice League arc. He was raised on New Genesis and is a peaceful, good superhero. So that’s just bonkers. It could be a bad scene, since the last time we saw the Greek gods mixed up with the Apokaliptan gods was the end of Amazons Attack, and what a ridiculous mess all of that turned out to be. However, I think this could be really cool, and the scheming evilness of Apokalips would actually mesh rather well with the fiendish Greek gods we’re currently enjoying. Now, to me the big question is whether there is one thing happening here or two. Is it one complete scene, where Orion busts out of the ice, puts on his helmet, and takes off through the boom tube, OR are these two different stories. Betrayal, death… perhaps the fall of Olympus. Or depending on how you look at it… a beginning. New gods. The blue panels seem to be about Olympus and the Greek gods while the red panels seem to be about Apokalips and Orion. So maybe, and this is just me spitballing here, the first two panels are the reckoning for the Greek gods. Apollo taking the throne has had repercussions, and now something’s coming for them. Perhaps that arm is Zeus himself, emerging to take back his throne. Then the last two panels are about what’ll happen with Orion and Apokalips, and something else entirely is going on there. I think I might be on to something with my “two different things are going on here” theory, but I’m not exactly sure what that something else is with the Orion stuff. Here’s my completely random, wild, unsubstantiated, and historically off-base theory: Zola’s kid is Orion. Or grows up to be Orion. The prophecy in the first issue said that “the one responsible shall rule in fire”, and what’s more fiery than Apokalips? The prophecy also states “one of your father’s children will murder another and take their place”, and isn’t there some Fourth World stuff about Darkseid’s downfall at the hands of Orion being prophesied? The prophecy here doesn’t say which god the child will murder to take their place… it could be Darkseid. 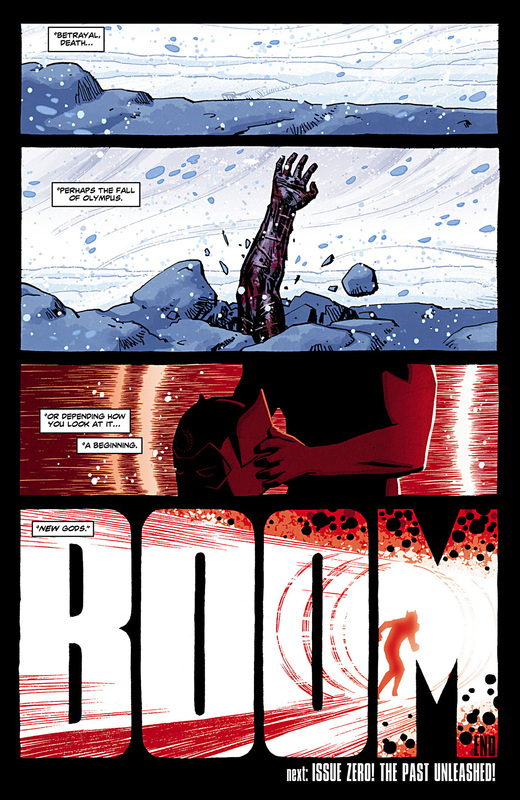 Of course, this theory has HUGE holes, namely that Orion is Darkseid’s son, not Zeus’. But hey, it’s a whole new universe!! Maybe they’re mixing it up. It would also mean that unless Demeter rapid grows that kid somehow, it’s not going to come up for a while. That would be a) lame, and b) make for a dumb tease. So I’m very likely wrong here. Or at the very least wildly off-base. But it’s fun to come up with off the wall theories!! Anyway, New Gods!!! I don’t know when and I don’t know how, but I’m excited to see what they’re going to do with them. We’ve got the previews for the next three issues, and after the #0 issue in September, the next two are all about the search for the betrayer, ie. Hermes. Tony Akins is also on art, and Azzarello seems to save the big stuff for Chiang, so maybe once that wraps up we’ll be into the New God stuff. OR maybe it’s just an editorially mandated tease for something DC has going on elsewhere, their Trinity War maybe. Who knows? Nicely done, guys. 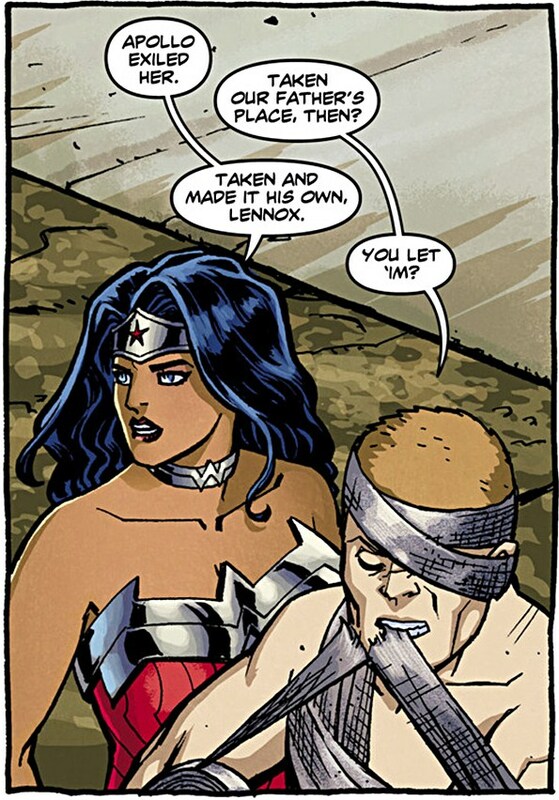 Wonder Woman’s been really good since the Hades storyline wrapped up, and it’s little moments like this that make me love it. 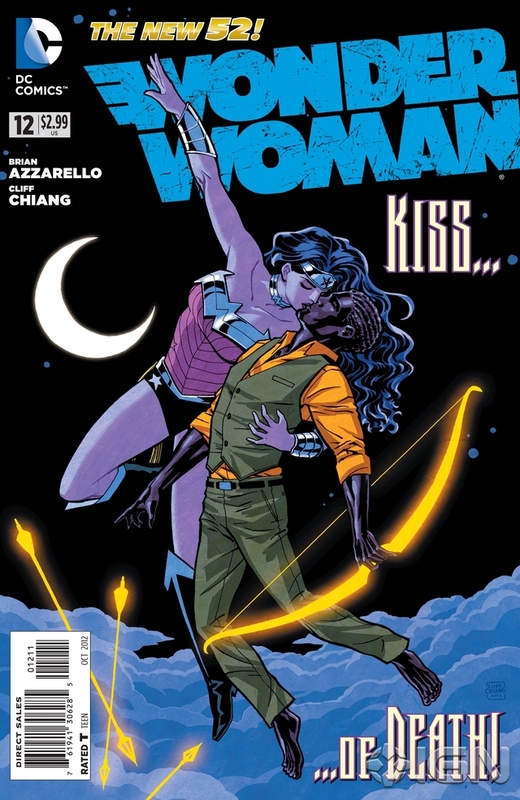 This entry was posted on August 16, 2012 at 4:44 am and is filed under Comics, WW Comics. You can follow any responses to this entry through the RSS 2.0 feed. You can leave a response, or trackback from your own site. Okay now that was an ending to end all endings. What a long and arduous trail its taken tho. Twelve issues to get to this ( admittedly satisfying ) conclusion and despite the surprisingly decent twists and turns – I never expected Hermes to be a traitor – I could debate if its being worth the wait. Too many supporting characters and Diana relegated to guest star status. I do love her massive power up however!!!!!! It’s a tricky thing with the supporting characters. I really love them all, but they do seem to push Diana out of the spotlight a bit. She always shines through in the big moments, though, which is good. Tim, I love reading your wrap-ups, you have all the background I lack, and it makes my reading that much the more richers! I loved this issue, as I have most since #1 (not the one with the succubi Amazons). And Karl I appreciate the time they’ve taken with Hermes. Had he been revealed a traitor earlier – I wouldn’t have felt the level of surprise/shock I did. And I love the supporting characters – I think had they been drawn by less-skilled hands (I mean literally and narratively) maybe they would have bogged down the story, but one of the (many) reasons I’m so excited for each new WW is that I can’t wait to see who will show up and how they will be characterized. Apollo, Strife, War and Eros are particular favorites, but they are all rich even if only briefly met. It’s the genius of small touches like Lennox & the duct tape Tim mentions above that achieves such rich characterization in only a few pages/panels/moments. Anyway – I loved it! Tim, thanks for taking the time to lay it all out. Thanks so much, Susanna! Yeah, the succubi Amazons were a bad scene… I had some serious trouble with the book for a while after that, especially with the lackluster (to me anyway) Hades story, but it’s really firing on all cylinders again now.